Scientists are often asked what drives them to spend so much time, work and energy on their field of research. In most cases, many hours of social and family life are mortgaged for the sake of results that will hopefully justify so much sacrifice. Some respondents talk about the prestige that comes with being a reputed scholar; others hanker after the money, while yet others admit they could live no other way. In extremely rare cases, however, one of these scientists gets lucky enough that their goal comes looking for them first. Elena García, a chief researcher at the state-funded Center for Scientific Research (CSIC) and the founder of Marsi Bionics, has just such a story to tell. Back then, Daniela was a six-year-old suffering from severe quadriplegia following a car accident. She was doomed to be in a wheelchair for the rest of her life. Behind children like Daniela, there are often families who turn to scientists for a solution that will mitigate tragedies such as this one. 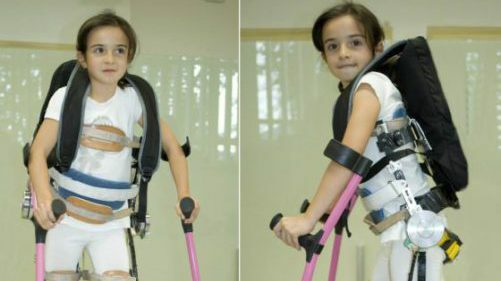 After many hours of lab work and a project that was funded by the Economy Ministry, a team of researchers led by Elena García achieved positive results: an exoskeleton ready to be tried out. The prototype, known as ATLAS 2020, came with significant improvements, such as a 40-percent reduction in energy use, intelligent joints able to control rigidity levels, and most important of all, the satisfaction of seeing a wheelchair-bound child walk again. According to the National Statistics Institute (INE), over 2.5 million people in Spain suffer from some kind of mobility problem. Although mechanical walking devices have been around for some time, there were no solutions oriented specifically toward children. ATLAS 2020 is a complex nine-kilogram structure holding together cables, motors and sensors for strength, pressure, temperature and other factors. The goal is to figure out what the wearer wants to do and help with the movements. Although it may sound simple enough, it becomes tremendously complicated when balance and the patient’s safety are added to the equation. Very often, patients wearing an exoskeleton have undesired movements or spasms. To guarantee safety, the robot must be aware of these unwanted gestures and prevent them altogether. It is expected that in future these devices will be “lucid” enough to maintain the patient stable even when the latter trips or falls. Experts agree that the great challenge for the coming decades is getting wearers to adapt quickly to this type of portable robot. Researchers across the globe are working hard to reduce these adaptation times. Bringing months of training down to just a couple of sessions could be key to the mainstream acceptance of this new technology. Giving the exoskeleton the ability to self-calibrate could be a particularly interesting and even necessary feature for children: as they grow, these patients will need to increase the power and dexterity of their outer suit. Another pending challenge for this promising technology is the vast amount of energy required to feed a device of this nature. This, despite the fact that the exoskeleton uses the wearer’s own inertia to reduce its power use. ATLAS 2020 uses battery packs, usually shaped like a backpack and worn as such, that need to be changed after two hours of intensive use. Recharging takes time, which means that patients need to have several spares handy to keep using the device. Although the technology seems promising, there is one serious hitch holding it back. Elena García explains: “We have the doctors who want it and the patients who need it, but as usual, we lack the money. Hedge funds, paradoxically, don’t like to take risks. They would rather invest only when a doctor is ready to prescribe this type of product.” But before that can happen, the exoskeletons need to go through clinical trials and hospital tests for a considerable period of time. This takes effort and, above all, money. So far, Marsi Bionics has secured funding through European research projects, and hopes to obtain the CE mark — a European product guarantee — by mid-2016.